For its second year counting, another sun sets on the Panorama Music Festival in Randall’s Island Park. 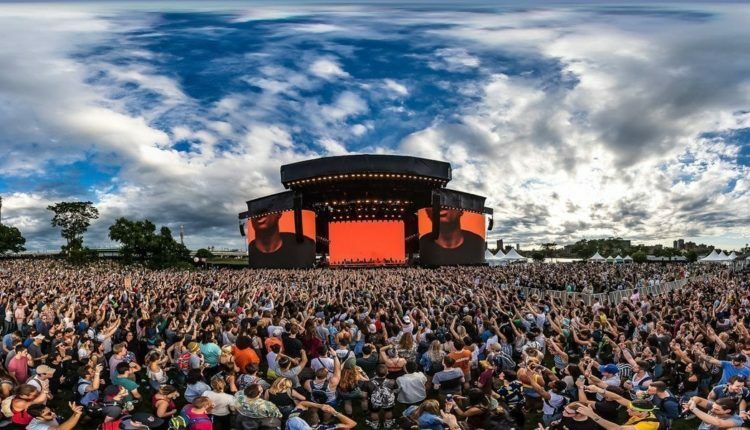 Along with a lineup spanning across a vast array of decades and styles, Panorama brought some unexpected surprises this year, most prominently a broad artistic landscape to admire and become engulfed in. Panorama’s biggest sponsor this year was HP, and they made it blatantly obvious. A massive tent and dome structured like the Florence Cathedral became home to The Lab, which required visitor participation to thrive, both functionally and artistically. One room would feature a giant globe of constantly-moving graphics. Take one touch of it, and the patterns would shift, creating an entirely new display. Another room had levers attached to brass instruments through long tubes, and each lever pulled created a new sound for the surrounding song played. Another room featured virtual reality glasses to transport visitors to another space. HP also brought us The Lounge, which was an activity center with live music all day, bandana printing, and interactive art photo booths (not to mention very long lines). Although one would say this was as equally an arts festival as it was music, it was the impressively diverse lineup that brought in attendees from all walks of life. 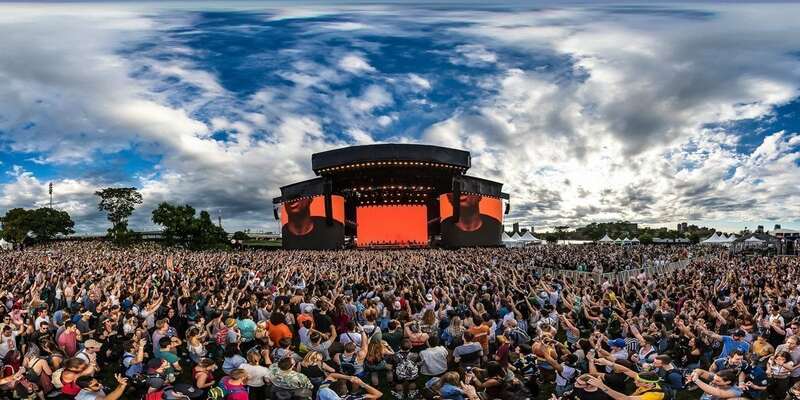 From R&B worshipers flooding in for Frank Ocean Friday night, to the industrial rockers jumping around for the closing Nine Inch Nails set on Sunday night, there was a place at Panorama for everyone, and everyone came from around the world to celebrate. After some perusing of Panorama’s endless food vendors, and catching part of Future Islands’ set on the Main Stage, in addition to confessions from their previous night (spoiler alert, the lead singer got too drunk), Spoon eased us into the evening at the Pavilion stage, where there was just enough room to squeeze your way to the front. Spoon jumped all over their catalogue for this set, from their newest release of Hot Thoughts (“I Ain’t the One,” “Can I Sit Next To You,” “Do I Have to Talk You Into It,”) as well as their 2014 release They Want My Soul (“Rent I Pay,” “Do You”). MGMT followed Future Islands on the Main Stage, and their set featured hits that brought us back to high school where we first fell in love with them. Songs like “Time To Pretend,” “Weekend Wars,” “Kids” and “Electric Feel.” As the night passed on, the stage lights became brighter and the crowd continued to flow in, preparing for the soul and R&B artists to come. Beyonce’s sister Solange took the Main Stage at 8, and if you haven’t heard of her before, she is best explained to have a similar-sounding voice to Bey, but with a completely different musical direction. Beyonce keeps to more of a hip hop base, with attention to melodic phrasing. Solange is more abstract, tuning her voice to an instrument timbre and embracing jazz influences to a trip hop style of music. She was the perfect way to segue the psychedelic set of MGMT to the simplistic beauty of Frank Ocean’s music. Saturday’s cloudy skies staved off sunburns and provided some refreshingly mild air as the early afternoon sets broke the silence of Randall’s Island. Opening The Parlor stage was the female-fronted gritty punk rock band BLEACHED, countered on the Pavilion Stage with NONAME dealing out some funky R&B beats. On a casual-paced meander toward the Panorama Stage, the laid-back rock grooves of Pinegrove, indie rockers from not too far away in Montclair, NJ. The easy-going afternoon saw one more act before gearing up for the evening. New York’s own Mitski welcomed many late arrivals to the festival as they finished their walk over the RFK Bridge. Though backed by a full band, Mitski closed her set solo bringing out a powerful lo-fi rendition of Patti Smith in her vocal performance. Back at the main stage following Pinegrove, Jagwar Ma turned their electronic dance rock into a big sounding, beat heavy jam including their songs “Uncertainty,” “Give Me A Reason,” “Come Save Me,” and the set-closing “O B 1.” Nick Murphy, who previously went by the stage name Chet Faker, had a rather impressive rock ‘n roll stage presence behind the fusion of electronic, rock, and trip hop. Closing out Saturday was a highly anticipated set by Tame Impala, whose Panorama set was the biggest show they have played so far in the US. Their live show was just as precise as their recorded songs but much more immersive with their visuals just as much a part of the show as the music. Like each of the previous two days Sunday saw a light crowd for the early afternoon sets. Early birds had an easy start before kicking into high gear with some mellow danceable beats from Maryland-based producer Shallou before a New Orleans style interactive revival set from NYC’s own Rev. Vince Anderson & The Love Choir. As more of the snooze button crowd flocked in, the warm July sun greeted alt rocker Bishop Briggs on the main stage while the dimly-lit set of post punk band Preoccupations was underway during the same time slot at the tented Parlor stage. The never-ending festival dilemma of competing set times was a nuisance as both sets would have been better seen in full rather than making a jump from one to the other. For anyone who knew the band Jack’s Mannequin, the lead singer Andrew McMahon has since moved on to a new project, known as Andrew McMahon and the Wilderness. Though they’ve had success with their recent album release Zombies on Broadway, the ensemble brings in a nostalgic audience from the early 2000s, and their set wasn’t complete without Andrew playing the early Jack’s Mannequin classic “Dark Blue,” which added an extra piece of satisfaction to the set. Andrew McMahon is a frontman and character of his own, constantly walking through the audience, crowd surfing, and even riding an inflatable duck above the crowd. Their set included parachutes and beach balls, entertaining us in a way our inner four-year-old could really appreciate. Glass Animals was the perfect following act on the Main Stage, as the artwork for their new album How To Be A Human Being lit up the stage in vibrant shades. From that album, they played “Life Itself,” “Season 2 Episode 3,” and “Pork Soda.” They also payed homage to their earlier album release that got them on the musical map, ZABA (“Black Mambo,” and ”Gooey”). Days before the festival, they released the single “Agnes” which they also debuted at Panorama to hundreds of fans spread across the Island. In a sudden shift in musical genre, hip hop legends A Tribe Called Quest followed Glass Animals, with an impeccable energy and bittersweet farewell as the group openly announced that this set was the last they’d play in New York as Tribe. Woven in between their latest releases from their November 2016 closer album We Got It from Here…Thank You 4 Your Service (“The Space Program,” “Dis Generation,” “Black Spasmodic,” “We The People”) and some of their influential songs throughout trip hop history (“Buggin’ Out,” “Check The Rhime,” “Bonita Applebaum,” “Electric Relaxation”), their set spanned over years of evolution, while repping the same Queens pride from their youth. They made several acknowledgements to the audience, including their gratitude for the support they’ve received over the last few years without founding member Phife Dawg. They even left an extra mic open on stage to keep his spirit present, and upon the end of their set, the applause was long and emotional as fans bid farewell to one of the greatest groups in hip hop history. Check out some sights from the three days of Panorama 2017 below (images provided by Panorama).